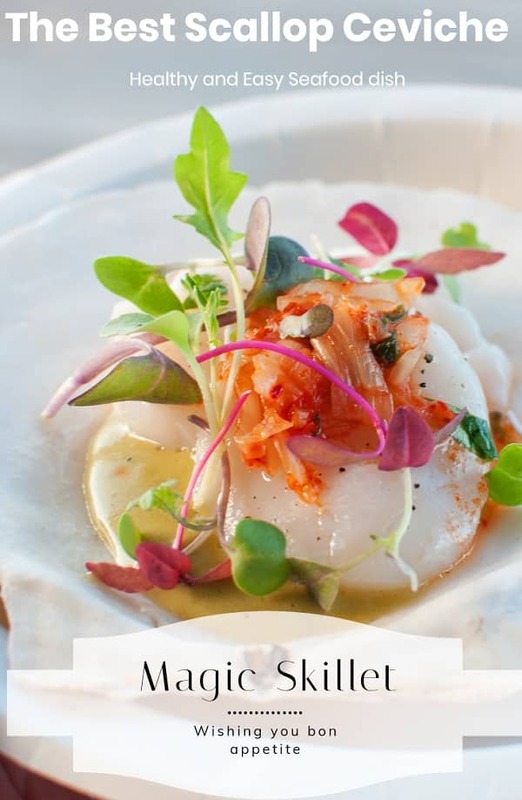 Scallop Ceviche recipe. Sea scallops mixed with fresh vegetables. Very healthy and delicious homemade seafood cocktail! How to eat scallops: Sear them, it is a very fast and easy way to prepare this seafood. Purchase fresh and dry-packed scallops. Place them in a large bowl. Preheat a large nonstick skillet over medium-high heat. While you heat skillet, pat scallops dry with paper towels and season with salt and cracked black pepper, to taste. When skillet is hot, add one tablespoon olive to it. Carefully place scallops in hot oil, seasoned-side down and season the top sides. Sear scallops until the bottom are caramelized (for about 2 minutes), then flip them and sear for further 1-2 minutes. Serve seared scallops with sauteed vegetables or cooked brown rice. Dry white wine is good to pair with this seafood recipe. In a medium glass or stainless-steel mixing bowl, place all ingredients. Stir well to combine. Cover and refrigerate at least 3 hours or overnight. Remove and discard bay leaves before serving.